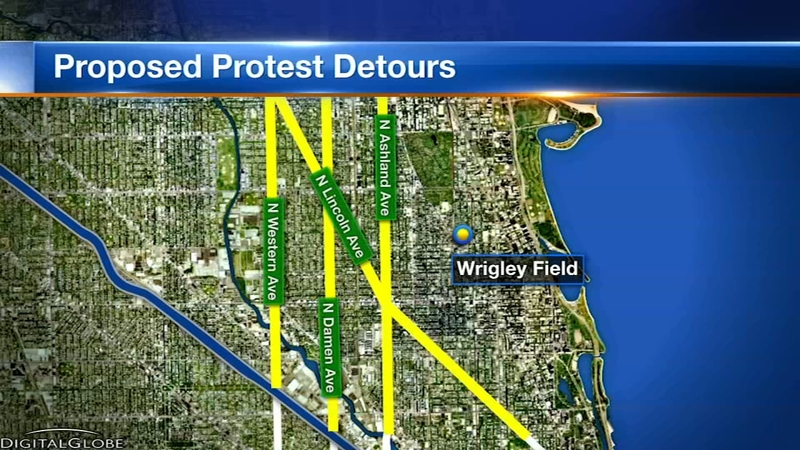 Plans are in place to shut down Lake Shore Drive Thursday afternoon as protesters plan to march to Wrigley Field beginning at 4 p.m.
CHICAGO (WLS) -- Plans are in place to shut down Lake Shore Drive Thursday afternoon as protesters plan to march to Wrigley Field beginning at 4 p.m.
Organizers say the group will enter the northbound lanes of Lake Shore Drive at Belmont and protest, before marching west on Belmont and then north on Clark Street to the ballpark. Chicago Police Superintendent Eddie Johnson urged protesters to be careful during the march. "We respect people's right to protest and protest peacefully," Johnson said. "What we won't tolerate is people coming out of the protest lines and trying to go in Wrigley Field without paying, things of that nature, we won't tolerate that." Chicago police said motorists are encouraged to avoid Lake Shore Drive during the afternoon rush Thursday, and should expect rotating closures in the drive depending on the size of the group. Police are expecting some form of limited closure on Lake Shore Drive between Fullerton and Irving Park Road. Anti-violence protesters plan to shut down a portion of Lake Shore Drive and streets around Wrigley Field on Thursday, at the height of rush hour. Here are several suggestions on how to avoid the gridlock. Chicago police said 200 to 400 additional officers will be in the area of the protest and march depending on its size. Police said they will not tolerate any disruption of the Cubs game or trespassing at the game. If the Cubs sign a complaint against someone, that person will be arrested, police said. "People are complaining about us coming there, but we could flip the script and the residents of Lakeview and Wrigleyville want to come march in Englewood and Lawndale and Austin, believe me, we'd love to have them," said Rev. Gregory Livingston, organizer. Residents and local businesses are unsure of what to expect and preparing for potentially the worst. At Al's Beef on Clark Street Thursday afternoon they were busy making sandwiches for the lunch rush. Located just down the street from Wrigley Field, they do a good business on game days. But with protestors planning to march right in front of the store, blocking traffic before the game, Thursday is a big question mark. They plan to bring in extra security. "I don't want my windows being broken," said Dan Gomez of Al's Italian Beef. "We'll plan for the worst and hope for the best." The city already has no parking signs in place along Clark. Many business owners are unsure what to expect, but they are taking precautions. Protest organizers plan to meet in the parking lot off Belmont before attempting to shut down Lake Shore Drive. They then plan to march up Belmont to Clark, then north to Wrigley field before the start of the game. They said the plan is to cause as much disruption as they can. Chicago Police are used to handling big crowd challenges around Wrigley Field. They managed to control the World Series celebration two years ago with few incidents. The Cubs issued a statement saying, "We hope this demonstration will start and end without disruption and allow the participants an opportunity to voice their concerns. Our goal is to also start and end our baseball game without disruption and allow our fans their opportunity to enjoy a day at the ballpark." The owner of The Alley, which is along the protest route, questions what protest organizers hope to accomplish. "I guess you get your TV time but I don't know if you get crime to stop and that's the real deal," said Mark Thomas.